The Australian Cattle Dog is an extremely intelligent, active, and sturdy dog breed. Developed by Australian settlers to handle herds of cattle on expansive ranches, he's still used today as a herding dog. He thrives on having a job to do and on being part of all family activities. He is loyal and protective of his family, though wary of outsiders. 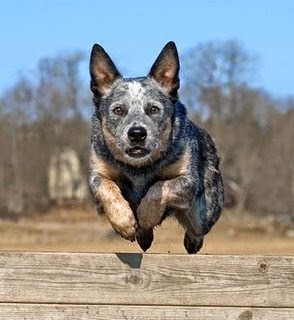 Besides herding work, the Australian Cattle dog does well at canine sports, including agility, obedience, rally, flyball, and flying disc competitions. This über-rugged and masculine breed is owned by some of Hollywood's hottest, including Matthew McConaughey and Mel Gibson. The Australian Cattle Dog was bred from a mix between a Blue Merle Collie and an Australian Dingo to create a herding dog with outstanding stamina and athleticism. A loyal and loving pup, this breed makes a wonderful companion for an equally active owner or family. The Australian cattle dog is of moderate build, enabling it to combine great endurance with bursts of speed and the extreme agility necessary in controlling unruly cattle. It is sturdy and compact, slightly longer than it is tall. Its gait is supple and tireless, and it must be capable of quick and sudden movement. Its ability to stop quickly is aided by the rudderlike action of its tail. Its weather-resistant coat consists of a short, dense undercoat and moderately short, straight outer coat of medium texture. Smart, hardy, independent, stubborn, tenacious, energetic and untiring — these are all traits essential to a driver of headstrong cattle, and all traits of the Australian cattle dog. This dog must have a job to do or it will expend its efforts on unacceptable jobs of its own. Given challenging mental and hard physical exercise daily, it is among the most responsive and obedient of dogs, an exemplary partner in adventure. It tends to nip at the heels of running children. Other identifiers: Strong, medium-sized body frame. Tail is never docked. Pricked and pointed ears. Possible alternations: At times, black face mask over one or both eyes is present. The Australian Cattle Dog is extremely active, both physically and mentally. He needs a regular job or activity to keep him busy, tired, and out of trouble. Nipping and biting is the Australian Cattle Dog's natural instinct. Proper training, socialization, and supervision help minimize this potentially dangerous characteristic. The Australian Cattle Dog is a "shadow" dog; intensely devoted to his owner, he does not want to be separated from him or her. 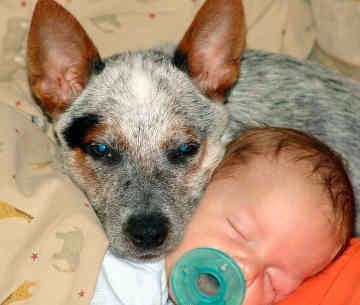 The best way to help the Australian Cattle Dog get along with children and other pets is to raise him with them from a young age. 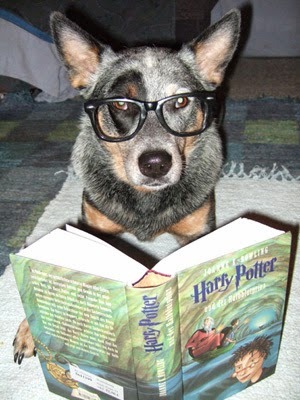 Australian Cattle Dogs were earlier known by the breed names Queensland Blue Heelers and Australian Heelers. 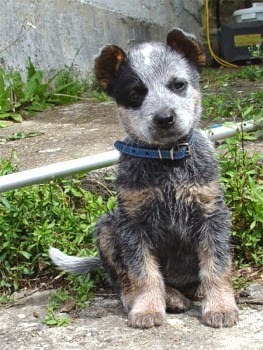 They are often still referred to as Australian or Blue Heelers. 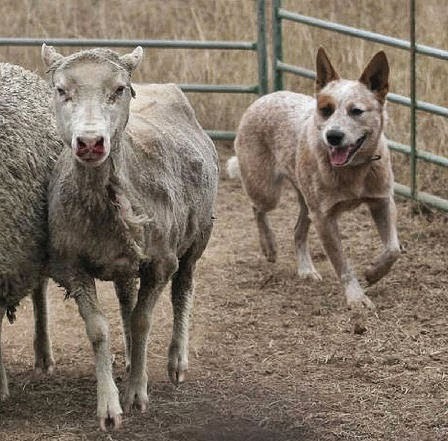 Their beginnings can be traced to the 1800s, when cattle herders that had emigrated from Britain to Australia found that the sheep herding dogs they had brought with them were not adjusting to the harsher environment of the outback. The Smithfield dogs, as they were called, had thick coats that had suited them well back in London, but that weighed too heavy on them in Australia. Ranchers complained as well that the Smithfields bit too hard and barked too much, making their cattle anxious and prone to lower weights. 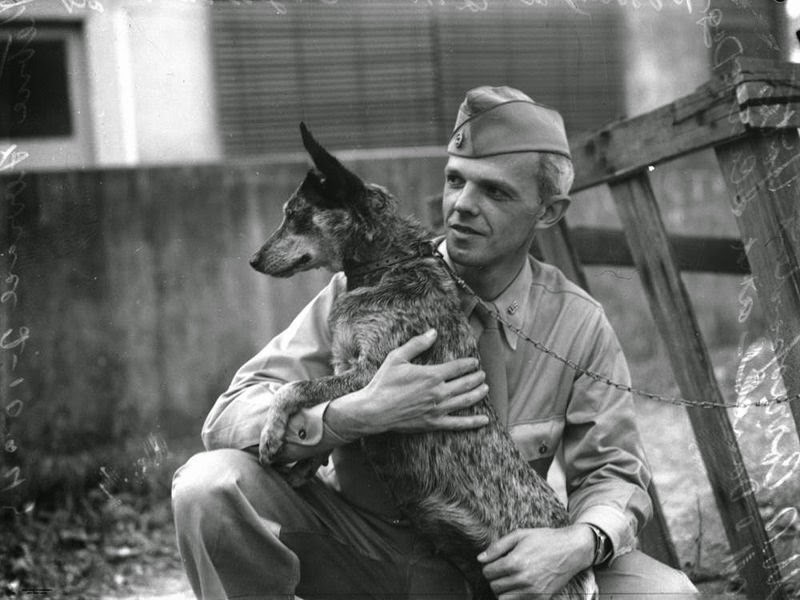 The need for a dog that could survive under harsh conditions in the rough tracts and manage the cattle without getting too rowdy or rough with the cows led to a long period of breed experimentation, beginning with a man named Timmins who crossed the Smithfield with the native Australian Dingo. It was not a successful pairing, as the resulting progeny was too aggressive, but it was the beginning of the recreation of the Dingo as a working companion. More successful was Thomas Hall, of New South Wales, who crossed the Dingo with the Blue Smooth Highland Collie. The offspring proved mush more useful here, and came to be known as Hall's Heelers. Along the way, subsequent cattlemen bred other dog breeds into Hall's Heelers in order to strengthen the breed and improve upon it, most notably the Bull Terrier, which lent its tenacious nature. Brothers Harry and jack Bagust bred the Dalmatian with one of Hall's Heelers, which added an affection for human companions, and further on added the Black and Tan Kelpie to the line, for its working ability. It was at this point that the Australian Cattle Dog breed truly took shape. Heelers gained popularity in U.S. very slowly, finally receiving recognition from the American Kennel Club in 1980. Since then, the Australian Cattle Dogs have shown great merit as a show dog. Couch potatoes look away now! This breed not only requires daily exercise, but also hours of rigorous activity on a constant basis. The Australian Cattle Dog can easily adapt to most environments but is best suited for open land and room to roam. Apartment dwellers might want to opt for a less-active breed, unless hours of daily physical activity can be arranged. This breed is very low maintenance in the grooming department and has little-known health issues. With this pup by your side, you'll have a longtime running partner you can depend on. The Australian Cattle Dog is a loyal, brave, hardworking, herding breed. One of the most intelligent breeds, it is not the kind of dog to lie around the living room all day or live happily in the backyard with only a 15-minute walk. It needs much more exercise than that and something to occupy its mind daily or it will become bored, leading to serious behavior problems. It needs action in its life and will do best with a job. This alert dog is excellent in the obedience ring and will excel in agility and herding trials. Can be obedience trained to a very high level. Firm training starting when the dog is a puppy and a lot of daily leadership, along with daily mental and physical exercise will produce a wonderful and happy pet. Protective, it makes an excellent guard dog. It is absolutely loyal and obedient to its master. It is sometimes suspicious of people and dogs it doesn’t know. It can be very dog aggressive if allowed to be pack leader, for its dominance level is high. Teach your Australian Cattle Dog that you are alpha and you will not tolerate him fighting with other dogs. Well balanced Cattle dogs are good and trustworthy with children. Some will nip at people's heels in an attempt to herd them; an owner needs to tell the dog this is not acceptable behavior. If you are adopting a pet, avoid working lines, as these dogs may be too energetic and intense for home life. Australian Cattle Dogs are very easy to train. Problems can and WILL arise with meek owners and/or owners who do not provide the proper amount and type of exercise. This breed does best with a job to do. If you do not have time to extensively work with and exercise your dog, or do not fully understand canine instincts and their need to have leadership, this is not the breed for you. Australian Cattle Dogs can survive under both cool and temperate climatic condition. They were bred especially for the sometimes harsh environment of the Australian outback. They can live in a secure shelter outdoors, but they also do well inside the house with the family. Ample physical and mental exercise, perhaps long sessions of walking or jogging, or specially designed agility exercises, such as Frisbee or course runs, will help the Heller to stay fit and to spend its excess energy. Grooming is easy enough, with the occasional combing and brushing to encourage hair turnover, along with weekly baths. The importance pf obedience and intellectual challenges for keeping the Australian Cattle Dog fit cannot be stressed enough. A Heeler without a job will be frustrated and unhappy. They are unsuitable for living an apartment life, or living in an environment that restricts their movement. 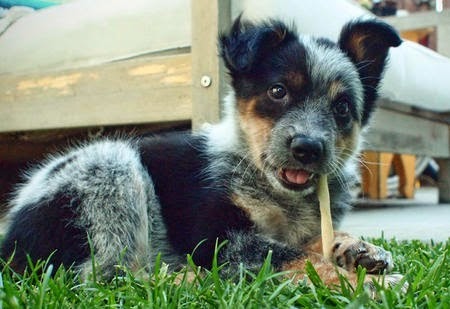 Australian Cattle Dogs have a lifespan of about 10 to 13 years. Some of the major health concerns include progressive retinal atrophy (PRA), canine hip dysplasia (CHD), elbow dysplasia, deafness, and Osteochondrosis Dissecans (OCD). Apart from these, some of the diseases that can be occasionally seen in them are lens luxation, cataract, con Willebrand's Disease (vWD), and Persistent Pupillary Membrane (PPM). Therefore, it is advisable to have regular tests on eyes, hips, elbows, and ears. These animals have incredible stamina and will enjoy all the activity you can give them. Exercise is of paramount importance—without enough they can become bored and destructive. Exercise cannot simply be tossing a ball. While they will enjoy this ball play, their brains need to be stimulated daily. Does best with a job. They need to be taken on long daily walks. Makes an excellent jogging companion. Do not allow this dog to walk ahead of you on the walks. He needs to be beside or behind you to re-enforce the human is alpha. The Australian Cattle Dog is good family dog, but he does best with children if he's raised with them and accepts them early on as members of his household. In such cases, he's very playful and protective. The breed's tendency to be mouthy — even to nip and bite — can be a problem with kids, however. He may want to herd them with sharp nips, or bite when youngsters play too roughly. An adult Australian Cattle Dog who has had little exposure to children will not know how to treat them and may be too rough. Some dogs are suspicious of children; because they don't act like adults, dogs sometimes perceive them as threatening. Most problems can be solved by carefully socializing the Australian Cattle Dog puppy to children, and by teaching him bite inhibition. The Australian Cattle Dog gets along with other dogs in his household, especially if he's been raised with them from puppyhood. However, because he is so devoted to one person in a family, there can be jealousy or squabbles between the Australian Cattle Dog and other dogs. Now, about cats and other small animals that the Australian Cattle Dog usually thinks of as prey: if he is raised with a cat or other animal from the time he's a puppy, he'll probably consider it a member of his houseshold and leave it alone. If not, he's likely to chase, catch, and even kill. Running, hiking, herding and jogging would be an excellent warm-up to a perfect day for the active Australian Cattle Dog. If yours is a puppy, start training early. This smart breed loves to learn and does best adapting to a family with children if training begins early. Loving and loyal by nature, the Australian Cattle Dog is happy being with you as long as downtime is reserved only for bedtime. Which are the more intelligent dogs?